Taking advantage of some free time today to wrap up the initial tutorial, before moving on to the career agents. If you haven’t already, I recommend reading parts 1 and 2, as well as this Eve for Noobs post, which this post builds upon. It’s now March 23rd, Rubicon 1.3.2, and our poor Theila has been greatly neglected over the past month. We can sell it outright. To do this we simply right-click the module and choose “Sell this item”, right? Almost. If you try that you’ll receive a warning that the item must be repackaged first (basically we want to box it up). Right-click the module, choose “Repackage”, and confirm. Then you’ll be ready to sell. More on that below. We can reprocess it into minerals, and either sell the minerals or hold onto them for our own future purposes (such as manufacturing other modules). To do so, right-click the module and choose “Reprocess”. You’ll receive a quote for the amount of minerals received, based on the current station’s facilities, your standings, and various other minutia. In Theila’s case I would be receiving 4 Pyerite and 39 Tritanium, while the station takes 2 Tritanium as tax. To commit, simply click the “Reprocess” button at the bottom of the window. Before selling the repackaged module I want to see what it is selling for. 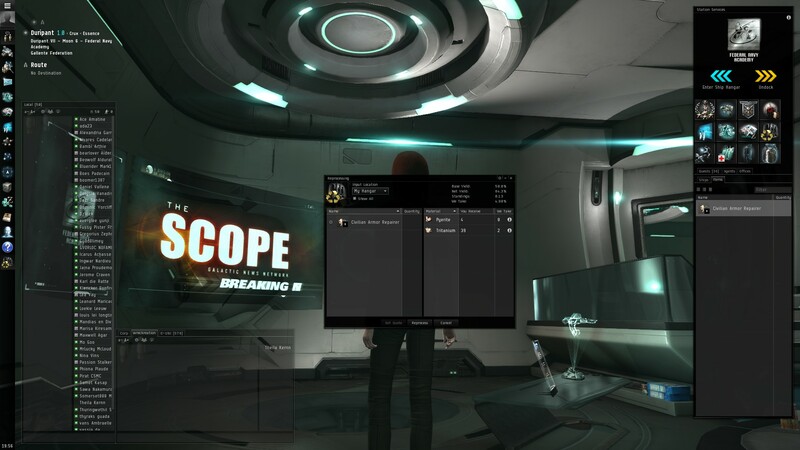 By selecting “Sell this item” on the right-click menu I’m presented with a window asking me to confirm the sale of my Civilian Armor Repairer at my current station for 7,000.03 ISK. Two things to immediately note here are that I’m informed that this selling price is at “-85.87% below the Regional average”, which basically means I’m selling short, and that the sales tax at 1.5% comes to 105 ISK, leaving me with 6,895.03 ISK in my pocket. That nearly doubles my money, but I can do better. To better our income, let’s first click the “Advanced” button to see more details on the sale. Here I can see that the average price for the region right now is sitting at 49,542.38 ISK, about seven times what I would have made by simply clicking the “Sell” button. I also see that there is a 100 ISK broker’s fee being applied to the sale at 1%. 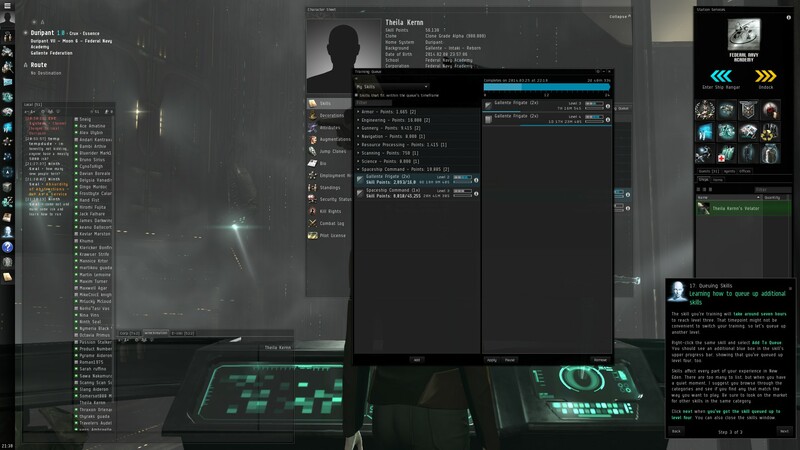 Both the broker’s fee and the sales tax can be reduced with particular skills, but I’m not going to worry about them for now as it’s a small amount of ISK. So now that I know what price I should be selling at, let’s figure out how I can do that by clicking the magnifying lens button to view the market details for the module. If you haven’t already, go ahead and sort the market data so that the Sellers pane is listed with the lowest cost at the top, and the Buyers pane is listed with the highest cost at the top. 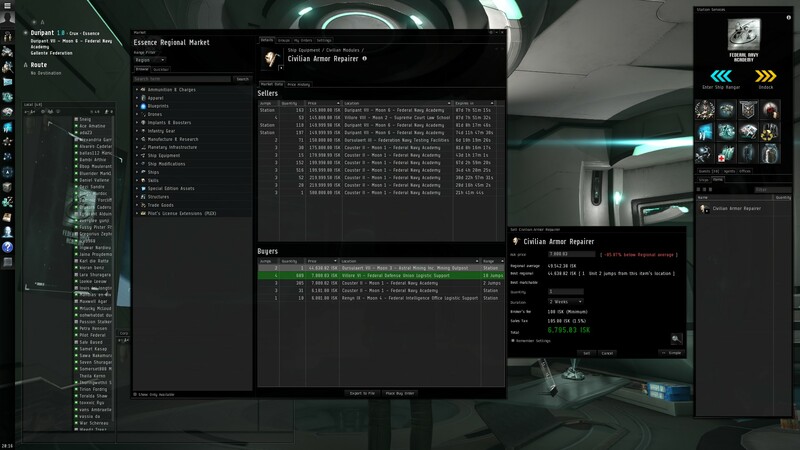 Investigating the Buyers pane I immediately see that my default sale was headed to a station 4 jumps away, where an enterprising player is looking to buy many of these modules on the cheap, likely with the intent to resell them at a profit elsewhere. 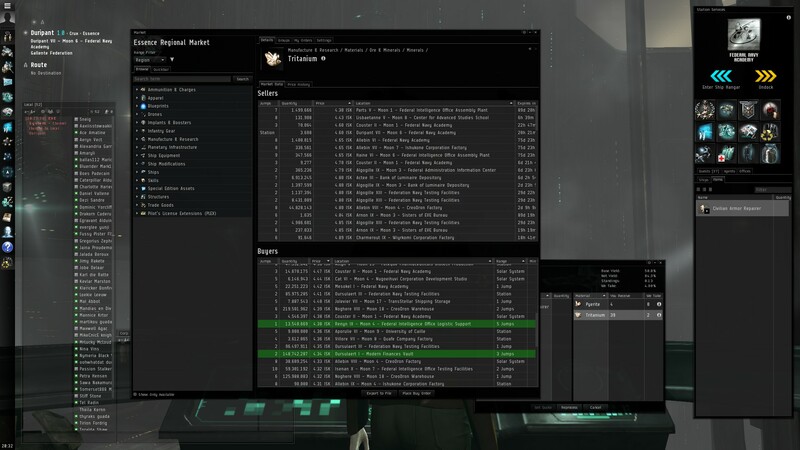 More interestingly, I spot that only 2 jumps from here someone is looking to buy a Civilian Armor Repairer for 44,638.82 ISK, a much better prospect for me. If you’re curious why my sale defaulted to the cheaper option it’s because that buy order is set to a range of 10 jumps – meaning anyone within 10 jumps of that station can sell to the order – while the higher buy order is limited to the specific station it is at. Looking at the Sellers pane shows that a number of players are actually looking to sell these modules for prices starting over three times the current best buy order. This is tempting, but before we commit to a higher-priced sell order which would not be filled immediately (i.e. there are comparable buy orders) I want to see how these modules have been moving on the market. To do so, click the “Price History” tab. Looking at the past month of data it appears the average selling price is a bit over 60,000 ISK, but has been steadily dropping the past week. Looking at the green bars along the bottom of the graph it looks like around 20-30 of the modules are sold each day. I could probably place a sell order for around 55,000 ISK, possibly a bit higher, with a 2-week duration, and make the sale. However, as a brand new player I want the money in my wallet now, so I would set my destination to the Astral Mining Inc. Mining Outpost in Oursulaert and sell there (remember to bring the module with you! 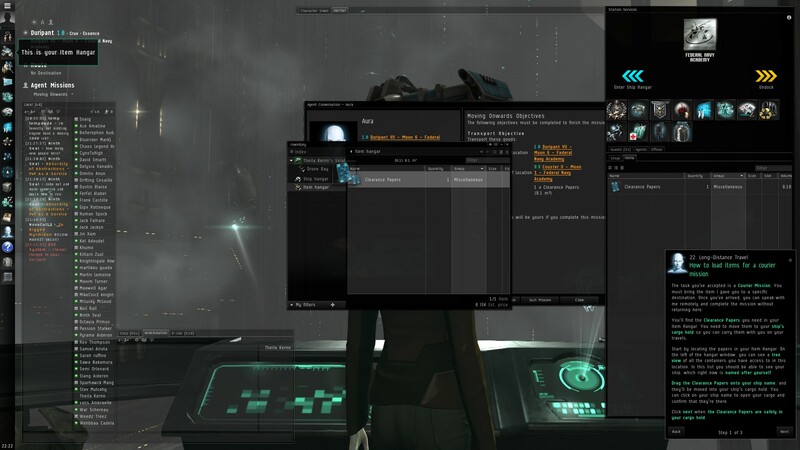 ), adding 43,522.85 ISK to my wallet. I can use a similar tactic to estimate the cost of selling the minerals earned by reprocessing the module by simply viewing the market details for each of the minerals gained. Right-clicking each mineral allows for quick access to the market details. Because minerals are used in the construction of nearly everything in the game, their prices tend to be relatively stable, and there’s usually no problem finding a buyer. 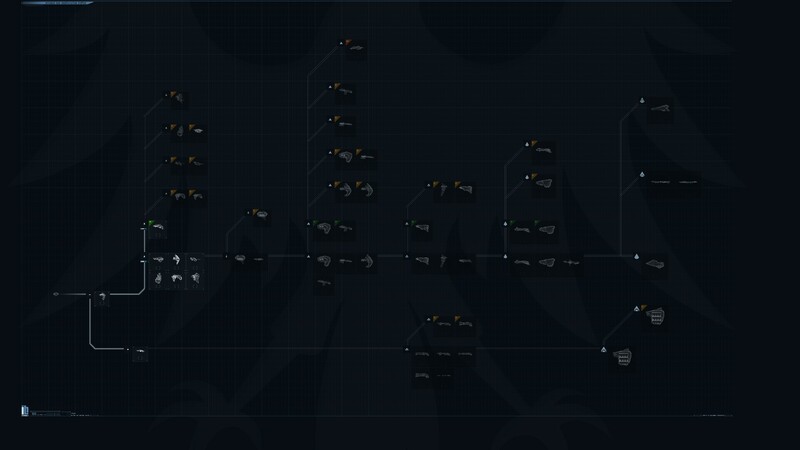 Looking at the available Buyers, I could immediately sell my 4 Pyerite for 11 ISK each and the Tritanium for 4.38 ISK each. 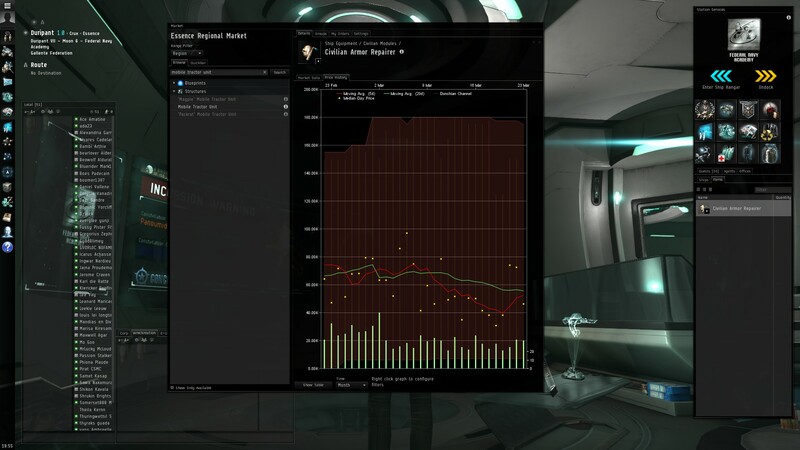 Though there is the chance to earn a bit more ISK with some travel to higher buy orders, it’s pretty clear that it won’t make a huge difference right now, especially when I’m looking at a total sale of 214.82 ISK for all of my minerals, and that’s before taxes and broker’s fees. There’s no question which is the better deal, so I travel two jumps (twice, since I forgot to bring it with me the first time…) and sell the repackaged module, then head back to continue the tutorial, now with a whopping 51,022.85 ISK in my wallet. Well looky here! After all that discussion last time of how important it is to keep skills training at all times to avoid lost time, I’ve let my new character sit idle for a month with nothing training (don’t worry though, I’ve had another character training instead). Let’s open up the Character Sheet and see what can be done about this at once! Personally I like to keep the windows I use the most open at all times, stacked together towards the middle of the screen, so that I can double-click on the title bar to hide/show the window group. The Character Sheet happens to be one of those windows, so I’m going to start setting this up now. Following the instructions I begin training Gallente Frigate to level 3, which will take a tad over 7 hours, and I queue up level 4 to immediately follow. I should be set for the next 2 days or so. For more fine control of your skill training, click the “Open Training Queue” button to display the Training Queue. Here you can the skills queued up for training, how long they’ll take to train, and adjust the plan using a drag-and-drop interface to reorder and add skill training. To remove an item from the queue you can right-click it, or simply click to select and then click the “Remove” button at the bottom. 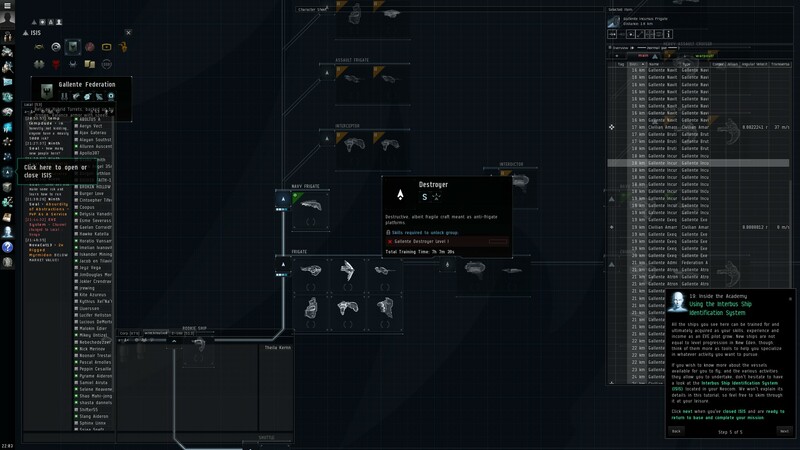 Be sure to “Apply” all of your changes before clicking “Next” to continue the tutorial. This is mostly old news by now, so go ahead and accept the mission and click through the tutorial for a brief refresher. Once you arrive at your mission destination follow the tutorial’s instructions to loot the Pilot Certification Documents from the Academy Office. The office should be pretty clearly highlighted for you by the tutorial, but if you have a tough time finding it check your Overview – the Academy Office will have a small diamond icon. Click “Loot All” to grab the documents and then continue reading through the tutorial and taking some time to check out the variety of ships nearby. When you’re done looking around, you can find the Camera Controls button along the left of your HUD, to the left of the “A” autopilot button. 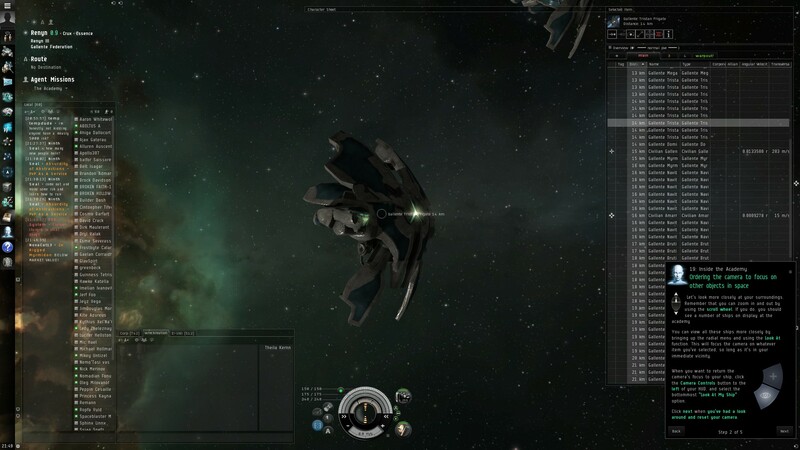 Clicking it will display a radial menu, with the option at the bottom used to “Look At My Ship”. Basically, it will reset your camera. We’ve already become pretty comfortable with the Show Info options throughout the game, so continue through the tutorial to ISIS. While the tutorial isn’t going to say much on this topic, it is worth touching on. 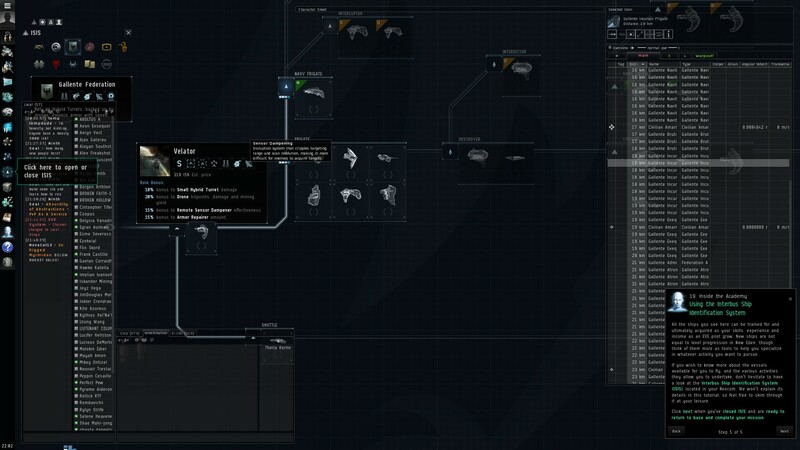 Specify the ship faction/race you wish to view using the buttons in the top-left. Grey ships represent those you do not have the skills to fly, while white ships indicate those you do. 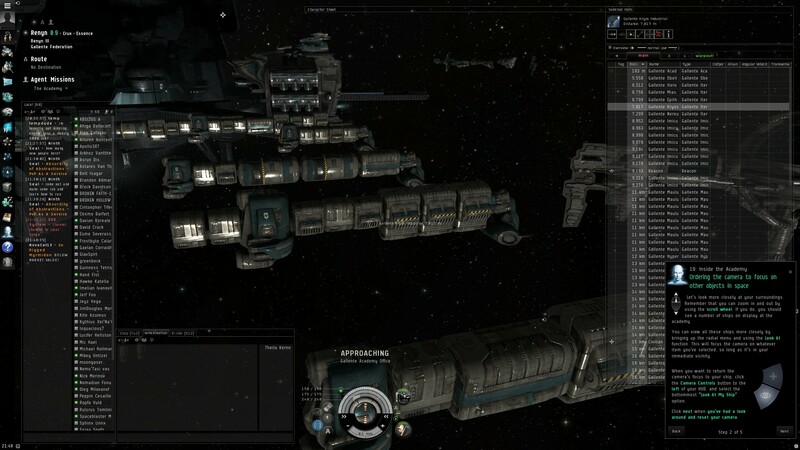 Ships are grouped by class, with more specialized and advanced versions of each class branching off vertically. 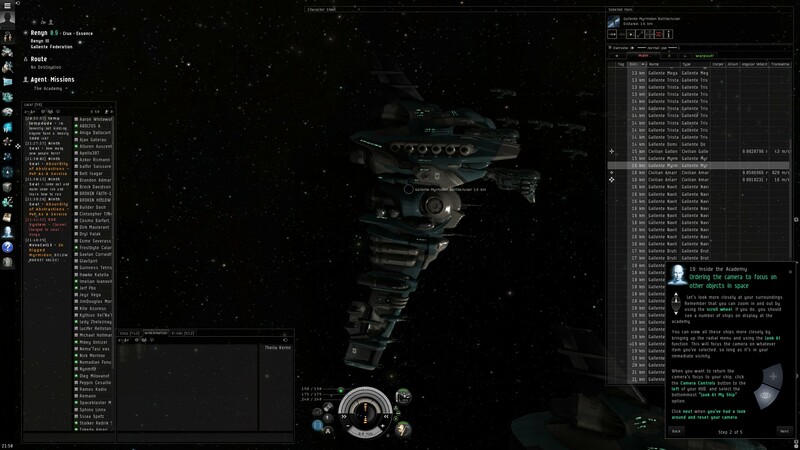 Combat ships are shown along the top tree, while industrial ships are shown along the bottom. Hovering the mouse over a ship group’s icon displays a description and characteristics of that ship group, as well as the core skill used to pilot those ships along with your level in that skill. 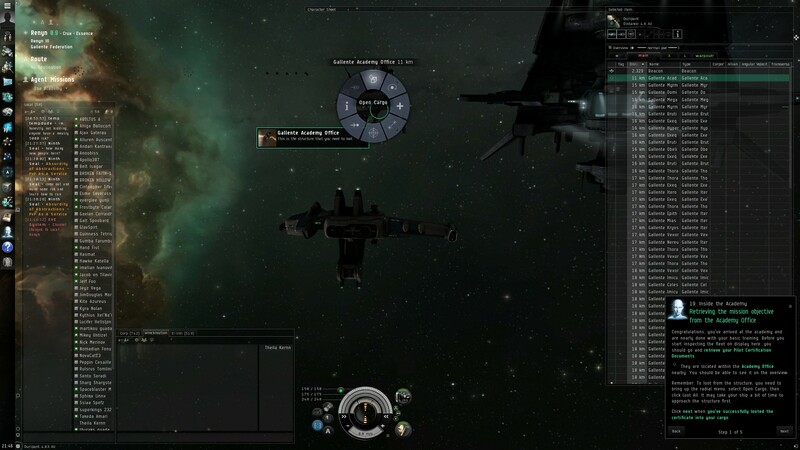 Hovering the mouse over a specific ship displays the characteristics of the ship, including bonuses the ship gains from its core skill, other skills, and any static role bonuses. 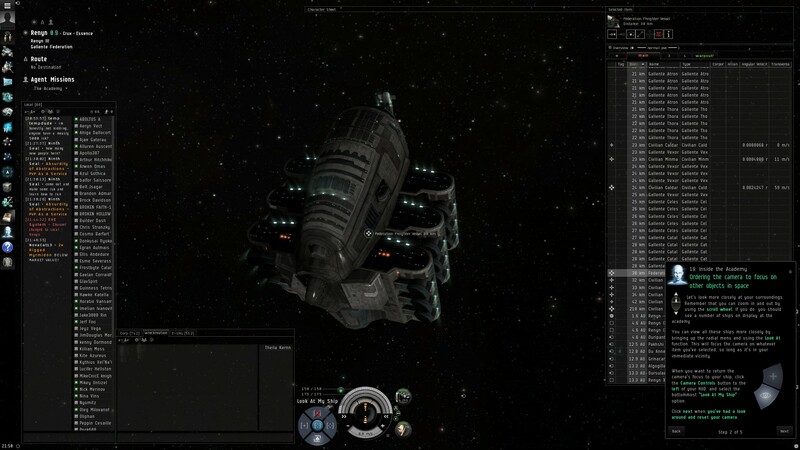 Clicking a ship will display its information window. ISIS can be extremely useful in identifying ships that interest you, modules that work well with these ships, and skills that allow you to pilot, and pilot well, your choices. The Journal is another window I like to keep up on-screen, so I dock it into the Character Sheet and proceed with the tutorial. Set your destination using the mission details or the Agent Missions menu at the top-left and fly back. If you are having a tough time finding the stargate with all of the ships nearby, try switching to your Travel tab (that’ll be the first tab, assuming you’ve installed Sarah’s Overview Pack), which will remove all of the ships from the Overview. Complete the mission, complete the tutorial, and click “Next”. It’s time to move on, which means that this basic tutorial is nearly at an end. Accept the mission and continue. Before we go, make sure you have the Clearance Papers on-board. Your Inventory is a nice way to see everything that you have immediate access to right now. 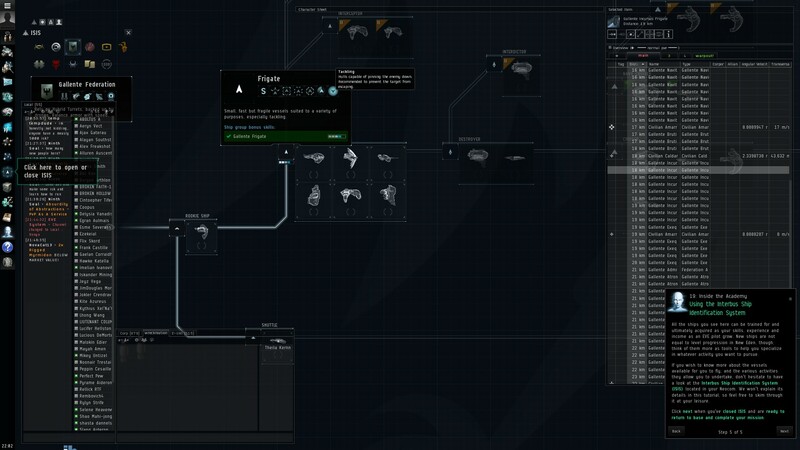 So for instance, while docked, you can access your current ship, your Item Hangar, and your Ship Hangar. 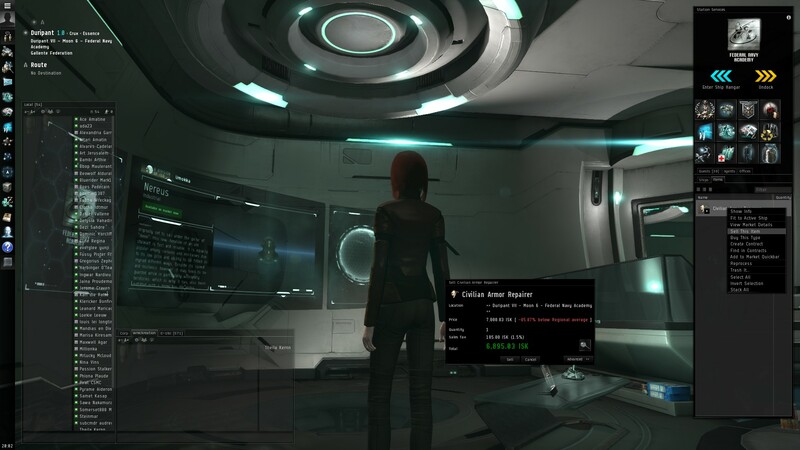 Locate the Clearance Papers within your Item Hangar and drag them to your ship, to move them to your cargo hold. As the tutorial points out, your ship name is somewhat bland at the moment. Not only that, but it’s also a bit tactically compromising as any other player who sees your ship by name will know exactly what type of ship it is. You can change you ship’s name by right-clicking it and selecting “Change Name…”. Autopilot will take you to your destination. If that destination is a station your ship with automatically dock there. Selecting the gate and choosing the “Jump” option will force your ship to warp to the gate at 0k – right on top of it – and then immediately jump through. Autopilot will instead warp the ship somewhere around 15k off of the gate, and then “slow-boat” its way to the gate before warping. Depending on the ship this can take 30 seconds, or significantly longer (several minutes), and will accrue additional travel time for each system you are traveling through. It can quickly add up to a much longer journey than if you were to travel manually. Similarly, autopilot will warp the ship in at a distance from the final station before flying closer and docking. Because of the added travel time approaching stargates and stations, autopilot should never be used when traveling across low-security or null-security space, while enlisted in Faction Warfare or otherwise war-decced/flagged, or when flying or hauling anything you can’t afford to lose. You never know when some jerk might take advantage of your ship slowly approaching a stargate to get a quick suicide kill. With that in mind, go ahead and activate autopilot anyway. Read through the additional info provided. Though it doesn’t provide much depth, all topics presented are valuable to keep in mind. You can find more about death and clones in some of my prior posts. If you are eager to start playing with others, you may want to check out Eve University or Brave Newbies, Inc., both of which exist to provide training and a home for new players, though I strongly recommend completing all of the Career Agent mission arcs, as well as the Sisters of Eve epic arc as soon as possible. Go ahead and complete the mission and continue to discover the Career Agents that are now available. Each Career Agent will provide a series of missions focused on their area of expertise. 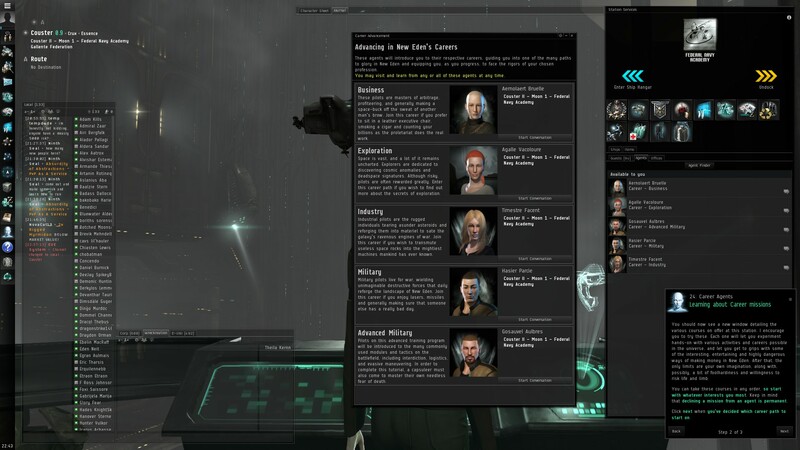 By completing the missions you will gain some great experience in the game – along with new skills, ships, modules, loot, and a fair amount of ISK. I highly recommend completing all of the career mission arcs. Congratulations! 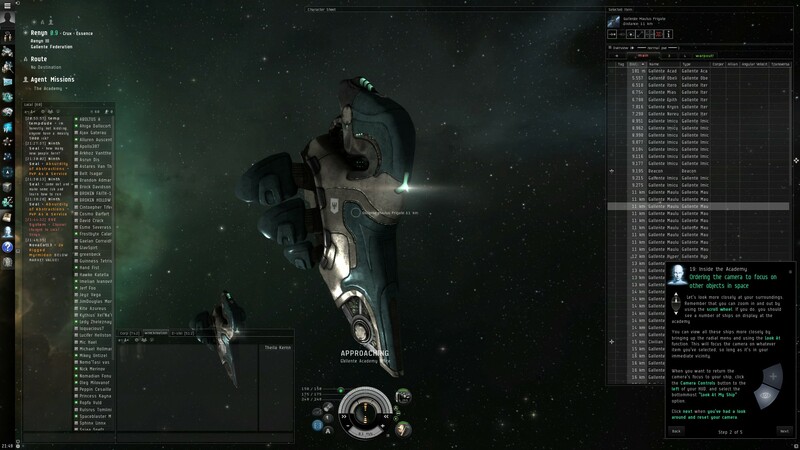 You’ve completed the beginner tutorial and taken your first (big) steps into the Eve universe. What you do now is entirely up to you, though the Career Agents will help provide some pointers and direction should any of them sound interesting to you. I’ll be continuing the tutorial posts here as I work through each Career Agent, and hope to see you in space soon!